Ted Cruz is in a really good spot right now. In the Republican primary, that’s a very good thing. Sen. Ted Cruz on Jan. 18, 2015, in Myrtle Beach, South Carolina. Photo illustration by Juliana Jiménez. Photo by Richard Ellis/Getty Images. When Ted Cruz announced his campaign for president, I said he didn’t have a chance. The Texas senator isn’t just extreme—an ideological outlier with hard-right positions on virtually everything under the sun—but he’s unpopular with other Republican lawmakers. He stepped on the stage as a critic of national GOP leadership and has used his influence with grassroots conservatives to force confrontations like the 2013 government shutdown. Cruz has burned his bridges with powerful party figures like Majority Leader Mitch McConnell—on one occasion, Cruz called McConnell a “liar” on the Senate floor—and is toxic to many of his Senate Republican colleagues. This isn’t new. Cruz has always been antagonistic toward his party. It’s why I was an immediate skeptic of his campaign. When choosing a nominee for president, political parties want consensus. They nominate people who satisfy all the party’s interests and constituencies. They don’t nominate gadflies like Cruz. Cruz is still an unlikely choice for nominee. But I was wrong to discount him. Not because he can win, but because—alone among the insurgent Republican candidates for president—he might survive Iowa and New Hampshire to face the establishment, one on one (or one on two). Here’s why. First, the polls. Every national Republican primary poll has three tiers. At the bottom are niche and vanity candidates who barely make a blip, like Louisiana Gov. Bobby Jindal and former New York Gov. George Pataki. At the top, right now, are outsider candidates like Donald Trump, Ben Carson, and Carly Fiorina, who will fade as we get closer to actual voting. And in the middle, there are the most viable candidates, who will rise as others shrink away or drop out. That final tier now holds three candidates who touch or approach double-digit support: Marco Rubio, Jeb Bush, and Ted Cruz. This isn’t in stone; Wisconsin Gov. Scott Walker dropped from the middle tier to the bottom and eventually left the race, while Rubio is inching toward the top of the pack as the most popular establishment candidate. Bush and Rubio are competing for the same pool of moderate and stalwart Republican voters—the same people who buoyed Mitt Romney until he could break away from the field in the 2012 primary race. Cruz is not. He’s fighting to be a Reverse Romney of sorts (Bizarro Romney is also an acceptable analogy). Instead of unifying mainstream Republicans into a bloc, he’ll rise as the most popular candidate of social conservatives, whose large numbers belie their modest influence on choosing the nominee but still hold some important sway. Working in his favor is the Bush/Rubio rivalry, as well as the Chris Christie and John Kasich candidacies, which split any runoff in the mainstream field. Working against him is the gaggle of conservative and outsider candidates, including Trump and Carson, who have sucked the oxygen from anyone fighting for the conservative base. But unlike the other anti-insider candidates, Cruz is positioning himself for future success—planning for when those outsider challengers leave the race. The most obvious example is his relationship with Donald Trump. The Texas senator has cozied up to Trump, defending him from other Republicans and standing with him onstage to criticize the White House. If and when Trump exits the primary, Cruz hopes to grab his support. Likewise, Cruz has been friendly with Ben Carson, who draws his support from the same conservative evangelicals that Cruz needs to succeed. Cruz has also poured his energy into building a campaign presence. “For every county in the first four voting states of Iowa, New Hampshire, South Carolina and Nevada,” reports the New York Times, “the Cruz campaign has locked down county chairs in charge of not just lending their names to the campaign, but of spearheading outreach and organizing efforts.” To that point, notes Eliana Johnson for National Review, Cruz has invested time, money, and effort into building support in Southern states. 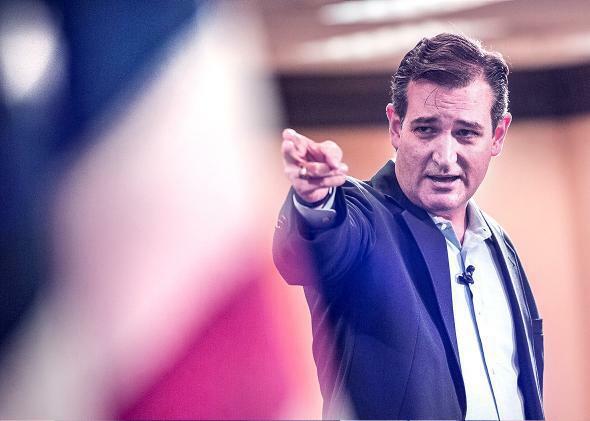 “Cruz also has a plan beyond Iowa. He has referred to the March 1 ‘SEC primary,’ in which eight Southern states go to the polls, as his ‘firewall’: that is, a backstop against whatever losses he might sustain beforehand,” writes Johnson. The reason, she continues, is straightforward: “Most of those contests, unlike the ones that precede them, are not winner-take-all, and Cruz’s goal is to win the most delegates rather than to take entire states.” These elections are before Super Tuesday; if Cruz can amass enough delegates, he can enter that contest with an advantage over his competitors. What’s more, the core challenge of Super Tuesday is money. For insurgent candidates, cash is the chief limit to future success. But on that score, Cruz may not have to worry. In the first half of this year, billionaires and other supporters put more than $37 million into his super PACs, while Cruz raised $14 million through small donations to his campaign. The Texas senator hasn’t released his numbers for the third quarter, but there’s a good chance they’re just as strong. This tells us two things: First, that Cruz has real and serious grassroots support. And second, he should be able to sustain his campaign through the early and mid-primary seasons. We also shouldn’t discount Cruz’s qualitative abilities. He is a strong, disciplined presence on the stump. To liberals, his style—a kind of polished preaching—grates. But it’s popular to conservatives and wears well with large audiences. And with fights over funding the government and raising the debt ceiling—more likely in the wake of chaos surrounding the House speakership—Cruz (who led the last shutdown) has a chance to bolster his national profile with conservatives, attract new volunteers and donors to his campaign, and make himself the most visible face of right-wing discontent in the Republican Party. The fundamentals of the Cruz campaign are strong. This doesn’t mean he will win, but he may face off against Bush or Rubio or Kasich as the last insurgent standing. Yes, parties avoid gadflies. But not always.